My promotion will include an ad that will be featured on several platforms, such as, billboards and online ads. For the promotion itself I wanted to keep it quite simple with a solid white background and chic layout. Also, I wanted to add a touch of my fashion sense with a croquis. I drew a very sleek green dress on the woman to add a touch of color, (Pantone's COY Greenery) and also resemble the elegant design of the 2017 Honda Civic. A company could have the most amazing product in the industry but if the product isn’t promoted enough, then the rest goes to waste. Promotion of products and services has grown immensely in recent time. From social media, to TV, to that beat up magazine in a nail salon; something is always being advertised. A very old school, yet still effective, method of promotion would be a billboard. For my advertisement product, that’s what I have chosen, considering we live in a big city where billboards are seen all around. Billboards are also extremely cost effective! Since billboards are generally placed along highways and busy streets, you'll be guaranteed that people will see your advertising. Also, unlike with commercials or magazine ads, you cannot flip the channel or turn the page on a billboard. Therefore, people will notice the billboard whether they like it or not. Another added benefit is that many people travel the same route repeatedly, such as with their commute to work each day. This means that they'll see your billboard regularly, which makes it more likely to stick in their minds,” (Chron.com). Products every single day, purposely or even non-purposely. “There Is No More Social Media -- Just Advertising,” (Proulx, Advertising Age). So, with that being said, I’m going to also promote the Honda Civic on the Honda’s social media platforms, as well as on different websites. The revolution was inevitable. With the pace at which technology was and is changing, it was just a matter of time (and not too much time) before people would start to get involved, get passionate and drive the success of the innovative and exciting tool that is social media. Also, the fact that it started out with people using it for personal reasons did not in any way dilute the strength that social media has for businesses now and in the future,” (Cohn, CompuKol Communications LLC). 2017 Honda Civic: "It's not only about how it looks, it's about what it does. But, it sure looks good while doing it." "It's not only about how it looks, it's about what it does. But, it sure looks good while doing it." In today’s world, what sales most seems to be the most extravagant and sleek product. The way a product looks is always important but many companies have begun to focus more on the appearance rather than the quality and capability. Which is why the 2017 Honda Civic is one of a kind. The slogan I am using explains that briefly because in reality it’s not always how it looks, but it better look great whilst doing so. I wanted my slogan to also have meaning, as well as a catchy aspect to it. Advertising doesn’t just include visual displays but words can be just as powerful, hence why a great slogan is so important! “Slogans are a vital part of marketing and have been used to help promote business and engage with customers for many years. They are not just an advertising ploy, since they attempt to get into the customer’s mind and stay there. That is why companies are always tinkering with this aspect of their branding. And it IS branding as your company name is always sandwiched between the slogan and a tag line,” (Selectabase.com). It can be quite difficult developing a great slogan, especially one that describes the product without being to length. Let’s not forget trying to avoid using a slogan that’s already been done before. The key is to make your consumers want the product, make them feel as if they cannot live without it. “A slogan is not just a tag-line that advertisers create; they play a strategic game; in the long run, good slogans play with customer’s mind making it believe yours is a reliable product. So, companies keep experimenting until they get a perfect piece,” (Humani, SocialMediaToday.com). My slogan will be used in my advertisements and will definitely draw people in. Advertising in the real world is one of the most difficult tasks, considering you may not know what appeals to everyone. But, that’s where proper research comes in to play. Looking at the way humans beings live their everyday lives, how they interact with each other and how they choose to spend their leisure time are just some simple ideas to analyze. Because, if you can’t appeal to people in the real world, then you might as well forget developing an amazing product. The best way to research is not just through the internet—you can always engage with people in real life situations. Asking questions of what interests your target market can get a company very far in discovering what satisfies their consumers. Many companies are now turning to real-life situations and using those as ads to appeal to many more consumers than before. In order to do that, companies have to make consumers feel as if they need a product to make their life even better than it already is. “One thing they do is to take a product and to put it next to lots of other things that we already feel positively about. For example, an ad for detergent may have fresh flowers, cute babies, and sunshine in it. All of these things are ones that we probably feel pretty good about already,” (Markman, Psychology Today). But, appealing to a modern day crowd has truly become quite easy, considering the powerful tool known as the internet. We are being exposed to advertisement every single day of our lives now with social media and we may not even realize it. “The number of people who regularly use various social media channels has grown dramatically and more and more people are getting more and more involved with social media to grow their businesses and to build relationships with other people all of the time,” (Cohn, Compukol Communications LLC). This is a great thing, however, for companies who are trying to promote their product. Social media can be seen by people all over the world! What a great way to advertise a product, am I right? 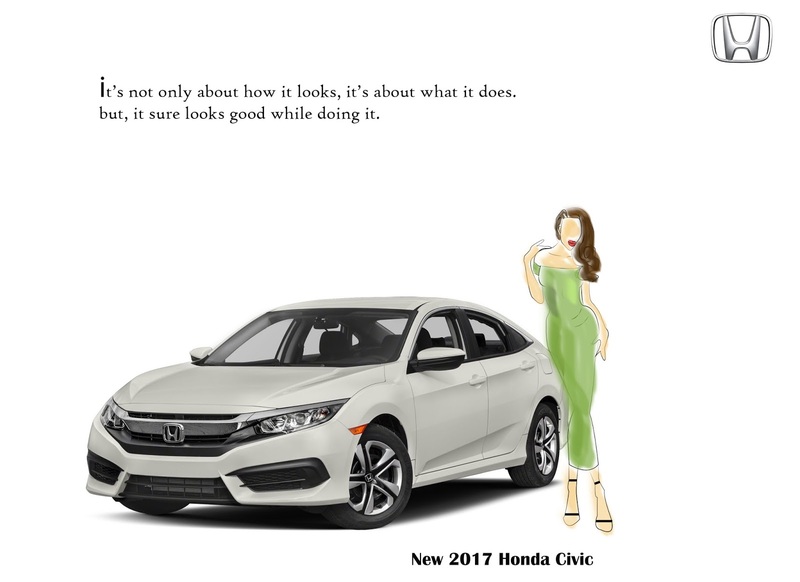 Advertising the 2017 Honda Civic in today’s real world will be quite simple, yet trying to create an advertisement that hasn’t been done before is the difficult part. But the key to a great ad is successfully relating to your customer and in order to do so, I chose to keep my ad campaign quite simple, yet straight to the point. “Simplicity: Simpler is generally better, and this applies to advertising too. A simple story, well told, is easily remembered. Too many cuts and complex stories create confusion and obscure your storyline. It’s that simple,” (Johnson, Black Enterprise). 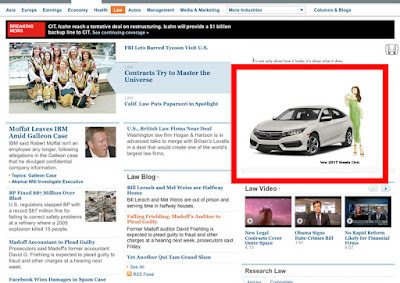 It’s no surprise as to why Honda is so successful and it’s not just because they do create amazing vehicles—it is also the exceptional job their marketer does. 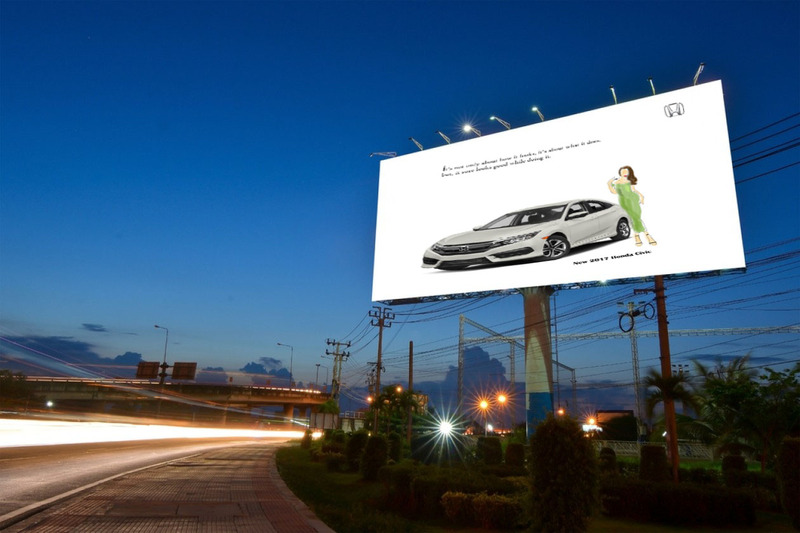 The big idea behind making a successful slogan, as well as ad campaign for the 2017 Honda was to express to consumers that a car can look great while still doing all of the thing a quality vehicle should do. The advertisement will feature a billboards, as well as ads ran on major websites and social media platforms. “Posting ads on websites that receive heavy traffic is one way to get the word out about your business,” (Lovering, Small Business Chron.). In order to get this message across I wanted to have a full understanding of car itself and all the components. Consumers tend to gravitate towards products that relate to their everyday needs—products that make them think that their life could be changed for the better, simply if they purchase this item being advertised. Which is why I want to create a simple and sleek advertisement that will convince the customer that they will be driving a luxury car but not for the luxury price. Including a piece of my fashion knowledge into the advertisement is part of the concept that this car is not only efficient and affordable but also stylish. Fully engaging with customers is vital, how else will a company discover what satisfies their consumers. “Customers are the most important part of any business because they are the lifeblood of your company,” (Treyger, Business 2 Community). In order to advertise to Honda’s customer, I took a look at their demographic. Who was buying the Honda Civic previously; age, gender and their annual income were some important questions to think about. Through research I found the Honda Civic purchasers tend to be quite young, millennials in fact. In order to appeal to that young crowd I wanted to execute a sleek and stylish campaign that still had some mature aspects. Millennials grew up sharing on social media. 75% of Millennials have a profile on a social networking site (Pew Internet). Millennials expect brands to have a social presence, but would rather see a brand without a social presence than a brand with unengaging, self-centered social media marketing. Don't take the shotgun approach or "spray and pray." As you begin, focus your efforts on where the audience you are trying to reach is participating the most. Start there and build your way up,” (Beechler, Marketing Cloud). My slogan "It's not only about how it looks, it's about what it does. But, it sure looks good while doing it,” is perfect for the young generation of today. Because, unlike consumers before this generation, millennials don’t just care about the appearance of something but also its quality. ©Foster2017. Simple theme. Powered by Blogger.